Poster for the Internet Connectivity Summit. Used under a CC-BY-SA license. The following is the Executive Summary of the Internet Society's Community Report on the recent Indigenous Connectivity Summit. To read the full report, please visit the Internet Society's website where it can be downloaded. The Summary is republished under a CC-BY-SA license. 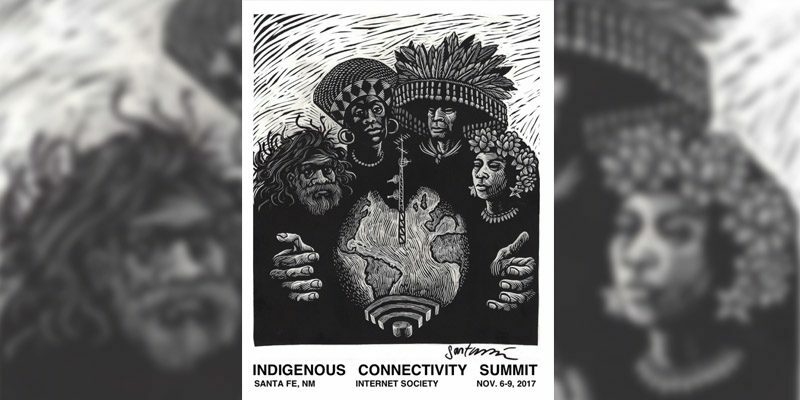 The Indigenous Connectivity Summit, held November 8 and 9, 2017, at Hotel Santa Fe in Santa Fe, New Mexico, was the first Internet Society meeting to focus on connecting North American Indigenous communities to the Internet. It drew more than 200 participants in-person and online for a two-day series of panels, presentations, and open discussions examining community networks in North America and abroad, including their impact on various communities. The Summit was preceded by a two-day training session for Indigenous people currently operating a community network and those planning to deploy one. The event launched a critical dialogue about what connectivity means to Indigenous communities and how to ensure Alaska Native, American Indian, Inuit, First Nations, and Métis communities have affordable, high-quality, and sustainable Internet access. Speaker and participant testimonials highlighted the vital correlation between connectivity and socio- economic benefits, including self-determination and autonomy, culture and language preservation, economic development, health, education and employment. There was a general consensus that community networks are an ideal path for Indigenous communities to empower themselves and drive their own connectivity solutions. 1. Creative connectivity solutions that focus on sustainability. 2. An enabling environment of supportive policies, funding opportunities and public education. 3. Capacity building and education within communities. 4. Easier access to spectrum for Indigenous communities. 5. Collaborative backhaul solutions founded on future-proof technology. 6. Research on the state of Indigenous connectivity across North America. Videos of the presentations and discussion are available at Internet Society’s livestream channel here.